PLAYING IN TEAMS MAKES YOU BETTER! Learning to play in orchestras and ensembles—Music Teams—provides a great atmosphere of mutual inspiration, camaraderie, and accomplishment. Building a strong music community means our students do not feel alone in their studies; they experience a sense of belonging and collaborative learning. By participating and performing in a GGP orchestra or chamber ensemble, students learn that their part is critical to the group’s success. Every person plays a key role in the success of the performance, and they must work together to make that success happen. Collaboration and teamwork are similarly vital skills to successes in school, admittance to colleges and universities and accomplishments later in life. By establishing these commitments to collaborative responsibilities and interactions, students gain a greater understanding of accountability and cooperating toward the fulfillment of common goals. Our students perform together throughout the year in concerts, recitals and community gigs. Performing as part of our Music Teams helps students learn to overcome stage fright and public speaking anxiety to become poised young adults ready to take on the demands of higher education and beyond. Teamwork = Improvement and Motivation! Students are strongly encouraged to take private lessons with an instructor of their choice in addition to enrollment in GGP. We enhance those private lessons by making music fun by providing full orchestral and ensemble playing (playing in teams) in addition to offering many live-audience performance opportunities. This partnership is complementary to both private teachers and school music programs, truly enhancing students’ education. Playing in teams inspires students to improve alongside their peers and motivates them to keep up their studies. • Reinforces Technique: While instrumental technique is taught during a student’s private lessons, playing in an orchestra and chamber ensembles helps students understand the reason for having learned the technique. • Increases Motivation: Learning in a group is enjoyable and motivates students, who see and listen to their peers play a variety of instruments giving them a better understanding of their own instrument, furthering technique and musicianship and the desire to play like others or better. Give your student the power of teamwork through GGP! We will inspire your child to achieve excellence playing in a team and teach them skills crucial for achieving success in life: making friends, building relationships, gaining university scholarships, developing community leadership skills, all leading to career and life success. 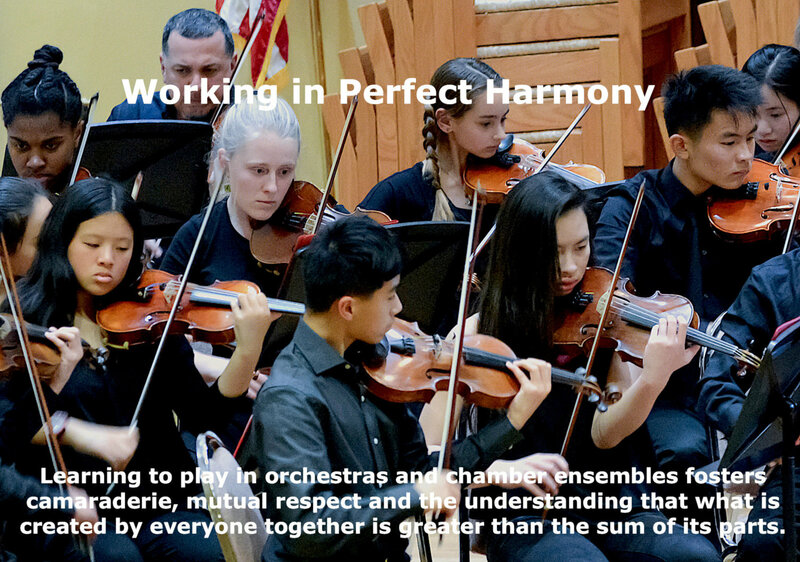 GGP offers a robust music education program including full orchestral training, sectional rehearsals, chamber music, theory classes, multiple concert and recital performances, an annual Cazadero Music Camp Retreat, and the opportunity to participate in our Gig and Volunteer Programs. GGP offers orchestral training and experience combining full orchestra rehearsals with smaller sectional rehearsals coached by professional faculty. Music rehearsed is primarily from the classical orchestra repertoire, with concert performances typically held in November, February and May. • CADET ORCHESTRA Beginner Level. No experience or audition required. • JUNIOR ORCHESTRA Intermediate Level 1. Some previous experience; music reading and basic theory desirable. • SENIOR ORCHESTRA Intermediate Level 2. Ensemble and sight-reading experience are a must. Ability to play major and minor scales up to 4 sharps and 4 flats. • CAMERATA – GGP’s advanced orchestra. Membership by audition only, and is limited to the finest players and most dedicated student musicians. In addition to section leaders (principal section players), two Conductor Assistant positions are available to cultivate skills and build recognition in each orchestra. GGP is proud to integrate chamber music into its program to expose our students to the vast and rewarding chamber music repertoire and give them the experience and benefit of playing in a smaller ensemble. Qualified soloists may also perform in chamber recitals or with orchestra accompaniment—a rare opportunity for middle school and high school age musicians. GGP hosts several chamber music recitals each season and provides other opportunities for the groups to perform. • CADETS work with their instructor on Tuesday afternoons. • MUSIC THEORY Classes held weekly on Saturday at All Saints’ Episcopal Church, 1350 Waller Street, (between Masonic and Ashbury in the Haight Ashbury neighborhood). • SUPPLEMENTAL THEORY: For those students who find it difficult or impossible to attend the Saturday class or who would like to have additional theory instruction and guidance, we provide instruction on Tuesday afternoons from 4:00 p.m. – 4:30 p.m. at SOTA before orchestra rehearsal begins. This should be considered a supplement and not a substitute to Saturday classes. Students are expected to do most of their work at home. • OPTIONAL ADVANCED THEORY: For advanced theory students interested in additional theory or composition instruction, Professor Alden Jenks teaches a supplemental class on Saturdays, subject to demand and enrollment, after GGP’s regular theory class. This class is not covered by tuition. Please contact Mr. Jenks directly to enroll and arrange private payment: aldenjenks@gmail.com. All students are strongly encouraged to attend the annual Music Retreat, held the Saturday and Sunday of Columbus Day-Indigenous Peoples Day weekend, each October at Cazadero Music Camp. This activity kicks off the new year, both musically and socially. Parents and siblings are also encouraged to attend. The retreat is included with tuition for all enrolled students; a modest additional fee applies for parents and siblings. GGP provides our students additional performance and professional playing experience opportunities, and our student performers even earn a small stipend ($5-$40 per event) through our “Gig” program. GGP provides student groups that play regularly for The Inn at the Presidio, The Carlton Hotel, the Guardsmen Christmas Tree Lot Family Day, San Francisco Art and Film Event for Teenagers, plus several opportunities per year at the Marines Memorial Club and Hotel holiday buffets, among other venues and special events. To participate in this really fun, enriching aspect of GGP, students must be proficient playing our “Gig Books,” attend enough practices to demonstrate proficiency, and have approval from faculty. Gig book practice will take place regularly on Saturdays at Mrs. Murray’s house, 3058 Market St., and is open to all Junior, Senior and Camerata-level students. At GGP, we believe in the power of music and the ability to heal the hearts, minds and souls of both the young and the old. We offer performances at no cost to homes and venues serving the elderly and disabled each season, such as the Alzheimer’s Association of Northern California. This gives our students and residents the opportunity to interact in a meaningful and rewarding exchange. Our students experience first-hand the impact that music has on others. Please contact office@ggph.org for more information or to inquire about availability. Instrument rental and financial aid are available! Joan Murray, GGP Founder & Executive Director Emerita, keeps San Francisco kids tuned into music. Read all about it here.